Sleek, and shiny, touchpad buttons, an LCD display -the induction cooker is not only practical, it's also a stunning, modern countertop appliance!As if by magic, the induction hob will heat any food or liquids faster than many other stovetops. It works by generating magnetic fields which heat up the bottom of your compatible cookware and the food within. Any food that spills onto the glass surface will not heat up.The Most Versatile and Practical Kitchen Gadget! ♨️ Energy Efficient – The induction burner uses up less electricity than gas, electric, coil or infrared cooking ranges.♨️ Child Safety Lock system – Press and hold the Safety Lock Key for 3 seconds to activate.♨️ Lightweight and compact for easy handling and storage – Cooktop measures 130 sq. inch.♨️ Fast Boil Button/ Keep Warm Button - Heats quickly and maintains a steady temperature. Will not heat up the kitchen.♨️ Built in Timer from 1 min to 4hr/240 minutes of steady cooking time.♨️ 15 power levels from 200-1500-Watts; 15 temperatures from 140 Degree Fahrenheit to 460 Degree Fahrenheit.♨️ Auto shut off - burner automatically shuts off after 60 seconds if no cookware, an empty pot or the incorrect cookware is detected.♨️ ETL approved - Built to North American Electrical Standards, 120V 60Hz AC.♨️ Equipped with diagnostic error message system, Low and high voltage warning system.♨️ Power cord is 5ft/ 1.5 meters long.Please Note: Not all cookware works on the induction cooker. Check the bottom of your pans with a refrigerator magnetic; if it sticks, it will work on an induction burner. 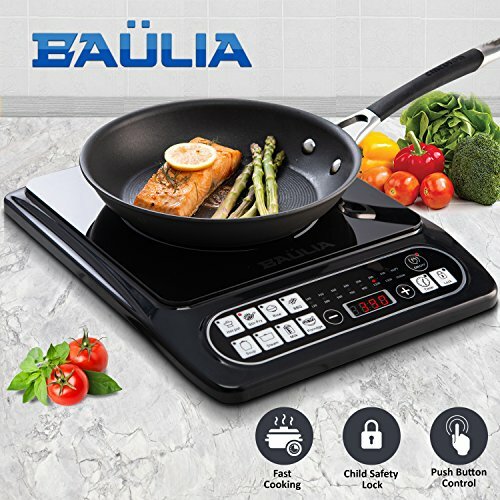 ♨️ ENERGY SAVING INDUCTION BURNER - The Baulia induction cooker uses up much less electricity than other stovetop burners and will heat up foods or liquids much faster than gas, electric or infrared stovetops. ♨️ NO HASSLE / EASY TO CLEAN - The smooth glass surface of the single countertop induction burner will easily wipe clean. The induction hob only heats up the pot itself, so any spills onto the surface will not get burned or stuck. ♨️ PRECISE DIGITAL CONTROL PANEL - The digital inductive cooker instantly responds to any temperature adjustments. Temp range from 140 F- 460 F. This cooking range has a built in digital timer, set from 1 min- 4hrs. ♨️ SAFETY SYSTEM WITH CHILD SAFETY LOCK - The single induction cooker has a Safety Lock system for kids, to prevent children from turning it on by themselves. The burner automatically shuts off after 60 seconds if no cookware, or the incorrect cookware is detected. ♨️ COMPATIBLE WITH MAGNETIC COOKWARE - This portable induction cooker is compatible with cast aluminum, enameled iron and steel, stainless steel with a magnetic bottom, or cast iron. If a magnet sticks to the bottom of the cooking vessel, it is induction ready. If you have any questions about this product by Baulia, contact us by completing and submitting the form below. If you are looking for a specif part number, please include it with your message.